“This time we thought we shall give a timeline to the vendor and define at each stage what we wanted. But he kept prolonging the project because he was being paid on an hourly basis,” recalls Srivastava. The company then figured out a technology partner, Kaay Labs, which now works with it on a Build-Operate-Transfer model. In the case of healthcare information technology startup Attune Technologies, it was their inability to monitor developers in the initial days that landed them in trouble. “It was a small office when we started off and the tech work was outsourced,” remembers V Ramakrishnan, COO at Attune. “The developers couldn’t sit in our office. So they worked remotely and we couldn’t keep a track on them as we were busy building the company.” Three months later, Attune hired two in-house tech developers. “We outsourced the front-end work because most people we had were back-end folk. That resulted in absolute confusion,” said Jayadev Mahalingam, founder of HR startup PiQube. “Our folks didn’t understand the front-end and the person who was developing frontend just did it for the sake of it and moved on after dumping the code on us,” he added. Later, he built an in-house team that scrapped the entire front-end and developed it internally. 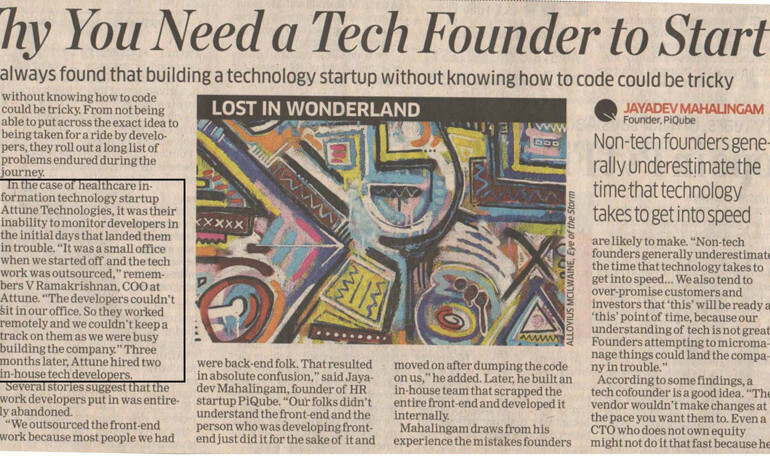 According to some findings, a tech cofounder is a good idea. “The vendor wouldn’t make changes at the pace you want them to. Even a CTO who does not own equity might not do it that fast because he has nothing to lose but a job. But if you have a tech cofounder who has some equity, he will do whatever it takes to make sure it excels,” suggests Antony Kattukaran, founder of SaaS enterprise startup Tagalys.